Welcome to my First Seven Series! I put together my top 7 go-to jeans for S/S season. This series is titled #BluePrints since it's all about these gorgeous denim / blue jeans. Alrighty, so let's get to this! First, my BDG Mom Jeans (in 3 different shades), have been my go-to for fun, sporty, street-style look (see right side). I love the 90's look (maybe cus I was a kid in the 90s and didn't know how cool the style was)! 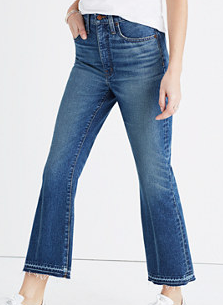 These BDG Mom Jeans' qualities are great, fit is perfect, and colors are spot on. These are very in-style and trendy, perfect for a variety of occasions. I bought these 3 in Belgium and Netherlands. You can find these at Urban Outfitters (See my Gallery below and click on the image to shop right away)! See my Vlog for detailing of all 3 BDG Jeans. Some of the different shades of the UO (BDG) jeans are not available online but should be in-stock in their retail locations. Last but not least, my Subdued Skinny Jeans (below). I know, skinny jeans? Aren't these so common and haven't we seen a million of the best of the best? Yeap, we have, but I placed these in my top 7 because of the fit, length and COMFORT! These are great ankle length and lower-mid-calf jeans for spring and summer season. After a wash, they go right back to their original shape and with the thin texture and material, it's quite cooling compared to other denim items that might be heat-friendly. 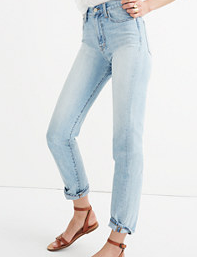 Next, my Madewell's Perfect Summer Jeans. Guys, these 2 have been my go-to for sophisticated and classy looks. They bring a more high-end style to blouses/ jackets/ floral patterns/ blazers. One is very rugged style with lots of rips and cuts and the other is a straight-leg solid pair. Both are light-washed and great for spring and summer! BDG (Urban Outfitters) Jeans. These aren't available online (in Belgium) so I placed similar ones from Madewell in the Gallery for you to shop. Shop this Gallery for my style and similar! I'll be doing this in parts of Blogs and Vlogs sharing Top 7 Items from Fashion, Beauty, Travel to Food. This series is called #BluePrints Series since it's all about these gorgeous denim / blue jeans. My vlog is up and you can see all the details to the jeans and my review of these jeans. This is my first vlog so I am kind of anxious and excited. I've always loved the number 7 due to this reason and wanted my blog to reflect something personal about me and thought doing 7-items for series would be really fun and enough items for you guys to see! Alrighty, that's it! Hope y'all enjoyed this and that this was helpful. Let me know what you guys think! If you have any questions or comments feel free to leave them down below! Stay Tuned for more Seven Series and my next blog. Thanks! Join my Style Journey and Follow my Instagram! The look gives a a feminine and girly feel but you can also chic-it-up with some cool jeans to give a more masculine tone too. Read here for more like this.